Nicole Arthurton Dennis (on the back right in the image) has worked in restaurants in one form or another since she was a little girl in her parent’s restaurant in Plymouth, Montserrat. 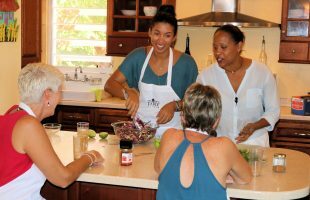 Prior to starting her cooking classes, Nicole served for six years as a private chef for an estate home on the exclusive island resort of Jumby Bay. Nicole’s love of cooking came from her mother (Pam) who is known for her ability to whip up a mouth watering meal in minutes. In the old days in Montserrat (before the volcano erupted), if you heard that Pam was cooking, you would always figure out a way to come. This was Nicole’s early life. Where Pam is known for her quick casseroles and hot saucees, Nicole has a well-earned reputation for Caribbean “twist” cuisine, decadent desserts, and flavorful condiments. Nicole’s special gifts, however, are found in her love of family, friends, and fresh and healthy ingredients. You can find out more about Nicole’s cooking in these travel blogs: Natalie Paramore: Toasted Coconut Cream Tarts and WanderPants.com. 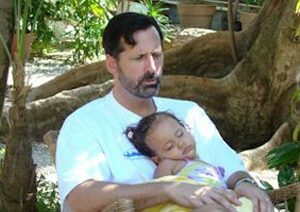 Adam relaxing at a friend’s house with daughter number 2. Emily Platt Dennis was born on Bastille Day, July 14, 2006. She is a feisty girl who always wakes up with a smile and a hearty laugh. Emily loves to cook with her mother, help round the garden tending to Nicole’s and her plants, and playing with her Piper Kit (a homemade computer). At 11 years old, Emily loves swimming, school, collecting every type of rock she can find, and plants and more plants. 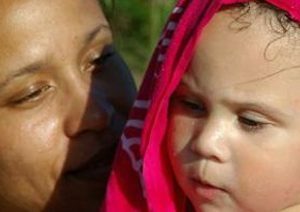 Nicole at the beach with her oldest daughter Zoe. Zoe, now 15, loves to read, going to the beach, competitive swimming, school, and playing with her dogs. Zoe has a great group of friends and is a competitive swimmer who has set a number of local records for her age group. Her favorite stroke? Breaststroke. Zoe is not as much of a cook as her mother, but plays a quality control role like her father… making her the Deputy Chief Taste Tester.